Shedding is often misunderstood. Or owners have a misconception about what is normal and what is excessive shedding. Seasonal shedding is perfectly normal in most breeds, and it should not be discouraged even if you could. Most dogs have a "double coat" - that is, they have long "guard hairs" that you see, and a layer of thick, downy fuzz next to their skin under the guard hairs called "undercoat". The undercoat is used for insulation and grows deep and dense in the Winter only to be shed out and discarded in Spring and Summer. Male dogs usually only shed profusely during the Spring and Summer molt. However, females often shed at the time of their estrus or heat cycle as well, and they rarely obtain as magnificent a coat as males. The main exceptions to the double coat are poodles and bichon frises, which never develop the undercoat and, thus, are known as "non-shedding" breeds. Puppies of nearly every breed shed their puppy coat before growing their adult double coat. This can be a very trying time with tangles and mats as the fuzzy puppy stuff falls out and gets tangled in the adult guard hairs growing in. Expect this and keep brushing! It usually happens between 6 months and 12 months depending on the breed. 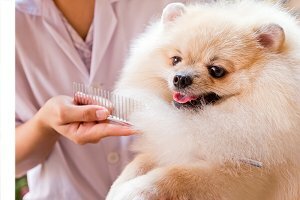 If you would like to lessen the impact of seasonal shedding, the best course of action is to either clip the hair very short at the beginning of Spring with Professional Clippers or to brush the undercoat out. An undercoat rake is just what the doctor ordered for that task. You should start at the fist signs of shedding and repeat the procedure throughout the summer if you notice more hair. It's a BIG job and takes elbow grease, but both you and the dog will appreciate it. There are two or three factors that can exacerbate shedding. To minimize unhealthy shedding, the skin needs to be kept supple and moist so that it can hold the guard hair shafts tightly in the pores. That means that the dog must be getting enough fatty acids in his diet so that the skin retains oil and he must NOT get the oil stripped from his skin or hair by harsh, detergent washing products. Hair that is dry and brittle breaks easily. What you might mistake for shedding could be broken, damaged hair that should have been moist and flexible. To insure the least amount of shedding, feed a high quality diet and supplement with additional anti-oxidants vitamin such as A and E as well as Linoleic Acid and Omega3 and Omega 6 Fish oils. See skin and coat supplements. See "skin treatments" in our index for food supplements that will help control shedding. Brushing does more than just eliminate tangles. You need to brush the coat frequently to bring the oils produced at the skin down each shaft of hair to coat the hair shaft with protective lipids. Under no circumstances should information presented here be construed as veterinary in nature. Always consult your veterinarian if problems persist.